Even with its recent delay, Final Fantasy XV is still not so far away and the hype around the core cast of characters continues to grow. This hype extends beyond just intrigue into the characters themselves, with the cosplay community jumping at the chance to portray these characters as accurately as possible. And when it comes to Gladiolus, you will be pushed to find a better recreation of his gigantic sword. SledgeHammer Cosplay has so far spent over 60 hours, spread across approximately three months, creating this masterpiece. And what a piece of work it is. There are so many little intricacies throughout and from the words of the creator, despite this, "it's definitely study enough to swing around." We hope you enjoy the this insight into the realm of cosplaying and the trials and tribulations of prop creation on this scale. Final Fantasy Union: The first question, of course, is... what's led to cosplaying in the first place? 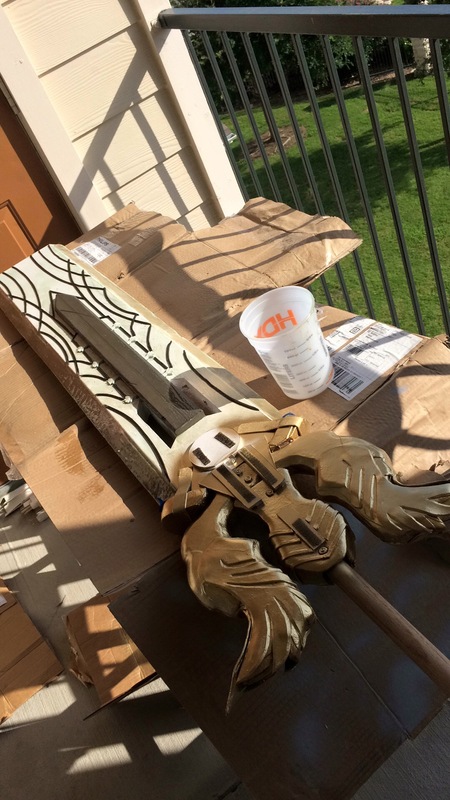 Sledgehammer Cosplay: On a whim, a couple of years ago I decided to make a sword (The Monado) from a popular JRPG, Xenoblade Chronicles. I loved the game so much that I wanted to create a memento. I had no previous experience with prop making, and scoured the web for How To videos. I didn't know what cosplay was at the time, and through my YouTube searches for tutorials I discovered this amazing community. Final Fantasy Union: What made you decide to do Gladiolus' sword instead of Noctis' and what made you decide upon Gladiolus in the first place as there are tons of other characters out there? Sledgehammer Cosplay: I like to cosplay characters that have large weapons. Weapons that define the character. I believe that Gladiolus' sword can be seen as a metaphor for his role in the story. On a personal note, I relate with Gladiolus in several ways. He's a Big Brother type character. He's often observant and quiet, only speaking when necessary. He has a strong will, personality, and is physically intimidating. He's a person of honor. In choosing what characters to cosplay, I am drawn to those that communicate personality traits that I find admirable. Final Fantasy Union: There's so much going on with Gladiolus' blade, with little nuances everywhere. How did you begin planning out your recreation and how long have you spent on the project so far? Sledgehammer Cosplay: This sword is by far the most intricate prop that I've made so far. I knew it was going to take a long time to make and I allowed myself several months to complete the project. I've been waiting for 10 years for this game (as everyone else) and knew that I needed to do the character justice. Between work and personal responsibilities, I worked on this sword for an hour here and there, over the course of 3 months. 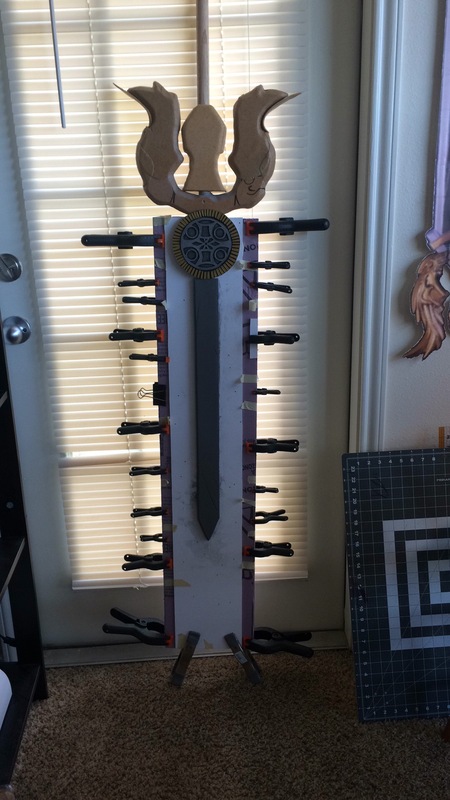 I've put a good 60 hours of work into this sword. Although I recall quite a few hours of simply staring at it while thinking, "I have no idea what I'm doing." Final Fantasy Union: With big projects like this, there are sure to be setbacks along the way, how do you stay motivated? Sledgehammer Cosplay: I draw a lot of motivation and support from the cosplay community. I participate in many local cosplay events/meetups/conventions as well as interacting with the online community. The people in the community are amazing. When I'm having a bad day, I turn to them for support. And they are ALWAYS there. In the construction of the sword, there were pleasantly little setbacks. Except one major issue I had. I left my sword on the porch one afternoon while letting the resin cure, and it was so hot out that the sword bowed like a banana. I was terrified it was ruined. Fortunately, I managed to bend it back into shape by leaving it outside for another afternoon. Thanks Texas heat! Final Fantasy Union: What were your most frustrating moments creating the blade? What was the easiest thing to make? Sledgehammer Cosplay: Probably the most frustrating part of creating this blade was making sure that both sides were identical. Making sure that all the small pieces were glued in the same spots on both sides. Also, anyone that has hand cut Sintra PVC without a heat blade can relate to this. After cutting all those tiny fan shapes out, my fingers were bruised by all the pressure it took. With the minimal amount of reference images I was able to find when I started this project, figuring out how to recreate some parts were very difficult. The easiest thing to make may surprise you. It's the resin cast skulls I made. Those went extremely well. Final Fantasy Union: How has the response been since posting up your progress pictures online? Sledgehammer Cosplay: The Final Fantasy crowd loves it. They are the ones that I worried most about satisfying. They, like me, have a lot of emotion invested in FFXV. And seeing someone succeed in creating something from a game you love is wonderful. I've received a lot of positive feedback from people who want to cosplay Gladio, gender swapped versions of Gladio, as well as feedback from people who want to cosplay other characters from Final Fantasy 15. Everyone loves a huge sword, as impractical as they seem. Final Fantasy Union: Given what the sword is made out of, think you'd be able to swing it around Duscae like Gladiolus himself? Sledgehammer Cosplay: It's definitely sturdy enough to swing around, and even take a fall. 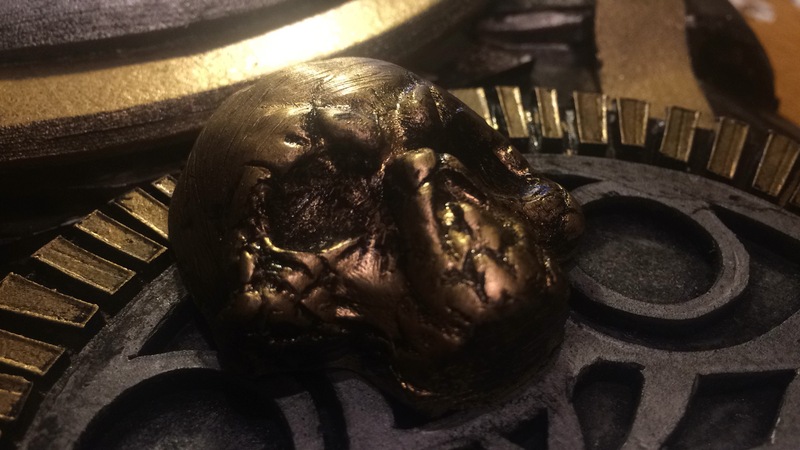 My first goal when making a prop is to make it durable enough to hand around to anyone who wants to check it out. And I often take photos with people while letting them hold my props. I love sharing my passion for cosplay with everyone. We hope you thoroughly enjoyed the interview and learning more about this awesome recreation. You can see plenty more images of the sword through its creation here. Also, be sure to check out SledgeHammer Cosplay on Facebook to keep up to date with progress and of course, the finished cosplay!